Once upon a time, there was an industry on the brink of implosion. Its members were consistently delivering the work their bosses requested, but half the time it was so disconnected from what customers wanted that it was useless. Rework ran rampant. Projects spiraled out of control, coming in horrifyingly late and absurdly over budget. By the turn of the millennium, the time had come for drastic measures. The industry is software development. One of those drastic measures was overhauling the relationship between developers and the people who use their software by employing a powerful tool known as the user story. 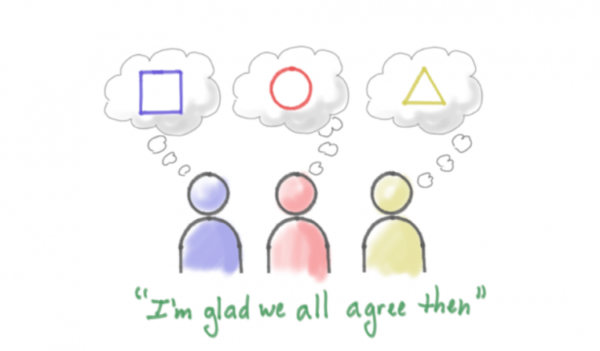 Since then, user stories have proven to be equally helpful outside the software world. When user stories are properly configured and applied in a content marketing context, they put audience needs at the center of content production, support efficient teamwork, and encourage interdepartmental communication. Don’t be misled by the word “story.” A user story is not a story in any traditional sense of the word. In fact, it should be only a single sentence. 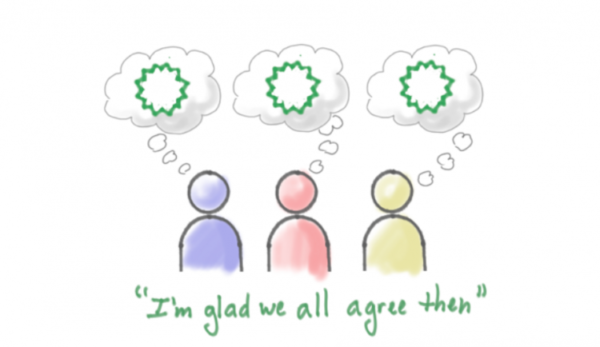 It’s a tool that helps teams align their efforts on a shared sense of an audience and its needs. If Kent had been a content marketer, he might have described user stories as stories about what an organization’s content enables people to do, stories that generate energy and interest and a vision in your content team’s minds. Kent argues that, rather than base software on massive specifications documents, developers should listen to people talk about the cool stuff they want software to do, like automatically fill in the city and state when they enter their ZIP code. As a [USER ROLE], I would like [A CERTAIN FEATURE] so I can [ACHIEVE THIS OUTCOME]. As a [PERSONA], I would like [THIS KIND OF CONTENT] so I can [ACCOMPLISH THIS]. 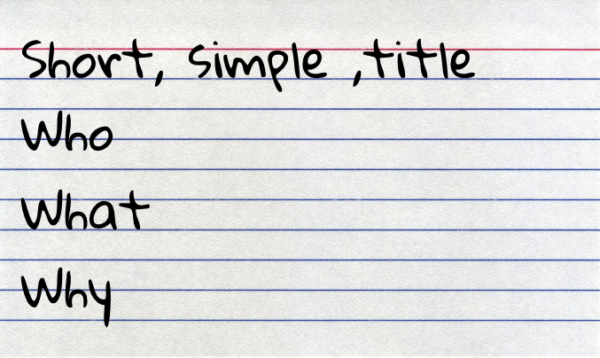 Don’t let this fill-in-the-blank template constrain you. Adapt it and use it in whatever way helps your team generate content ideas that will resonate and lead to conversions. All that matters is that you get the benefits of user stories – audience focus and clarity of purpose. 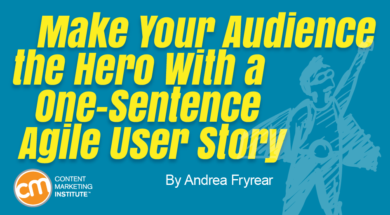 Rather than listing a bunch of SEO-friendly facts and calling it content marketing, create user stories that guide you toward thinking about how your content will help people. You don’t need to be on an Agile team to use this type of story. 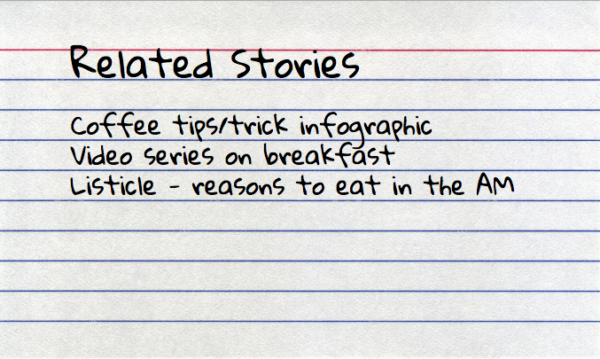 These stories can help any marketing team identify the right stories to tell. Create as many user stories as you need to cover the range of your audiences, content types, channels, and problems people are hoping to solve. What details should be in user stories to track content creation? You may want to go a step further and add details to your user stories that enable you to track progress as you produce the content. Let’s look at an example. Imagine that you work for a company creating an app that helps people navigate stressful mornings more efficiently. Your content team wants to create a series of blog posts that will result in people downloading the app. The objective for these posts is to offer insight into how to have a better morning. The four core elements – title, who, what, and why – help the team focus on the audience. 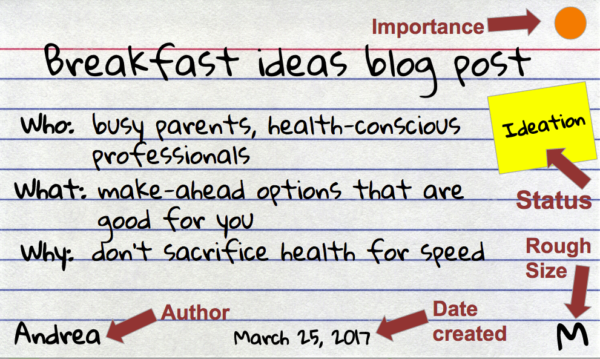 The added details – importance, status, rough size, date created, and author – transform the card into a tool for tracking progress while producing each blog post. Here’s how the added details (metadata) transform the user-story card into a tool for tracking progress of the content itself. Importance: A yellow/orange/red continuum indicates the importance of this post in relation to the other work you could be doing. You could label your continuum “high/medium/low” or use other terms. The goal is to quickly convey where this post falls on the team’s priority list. Status: Using a small sticky note, indicate the post’s state of production: brainstorming, creation, editing, publication, and so on. You can update the status easily as often as you like. Rough size: This card uses a simple small/medium/large scale. You could also provide an estimate of how many hours or days it will take to create this piece of content. Date created: Capture the date on which you created this user story. This information may help you avoid wasted effort. For example, if it has been six months since someone had the idea, you may want to make sure it’s still relevant before you create the content. Author: You may define author as the person who wrote the user story or as the person who ends up producing the content described. You might want to include both names. While user stories don’t require metadata like this, I recommend including it. Capture whatever details will help you map and monitor the flow of content through your team. On the back of the card, as shown below, you may want to jot down ideas for related stories. You could list pieces to crosslink or cross-promote, or topics you want to avoid repeating during the creation phase. Note whatever related pieces you think of that someone might find handy to refer to later. Where do user stories come from? You can certainly come up with user stories sitting at your desk just as you might come up with a plain old blog idea. But if you can involve the content team in writing user stories, you’ll be amazed at how much more cohesive your content becomes. 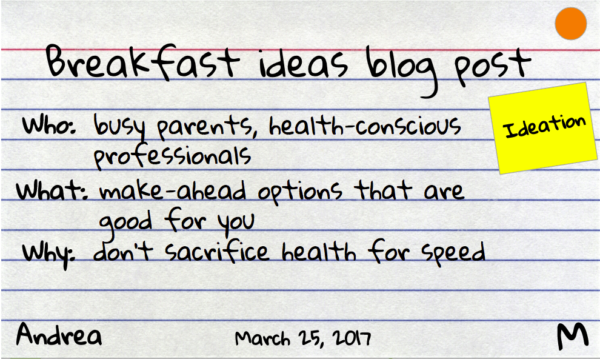 For instance, if your hypothetical team was in a meeting and someone said, “We should do a blog series about breakfast ideas,” everyone might nod in agreement. The writer, graphic designer, and editor all have distinct visions for how this series is going to go, but they don’t take the time to get those visions in sync or discuss how they all relate to the audience. You can imagine what happens when the writer works on a square and the graphics person contributes a circle. And we’ve all been that editor who gets the first draft of a square on her desk when she expected a triangle. By enlisting the entire group and pushing past a general concept into a written user story, you avoid this type of misalignment. Content teams expend less wasted effort, and audiences get a cohesive piece of content based on a multifaceted understanding of how to meet their needs. While user stories were developed as part of the Agile software-development movement, you don’t have to undertake a complete Agile transformation to use them effectively. Traditional (non-Agile) marketing teams can incorporate user stories into their processes and glean nearly all of the benefits. Even without a Kanban board or a Scrum Master in sight, a stronger audience focus and better internal alignment are still within reach, thanks to Agile user stories. 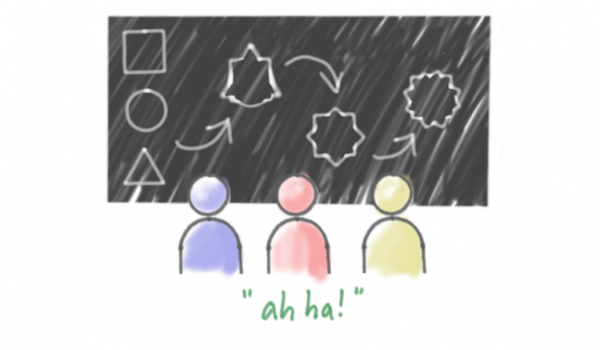 What do your team’s user stories look like?